That list is a bit of a joke, of course. High Fidelity's now-famous first sentence is "My desert-island, all-time top five most memorable split-ups, in chronological order" followed by a list of five names. Admittedly, it's not "It is a truth universally acknowledged, that a single man in possession of a good fortune must be in want of a wife." But Hornby, like Jane Austen, has marked out a particular stratum of his contemporary society that he has repeatedly mined for his fiction. In Hornby's case it's the man who clings to his youthful (usually musical) obsessions, even as he approaches middle age, in the hope that they will continue to provide his life with meaning and purpose. Hornby's novels are so successful in part because virtually every man can recognize an aspect of himself in these characters, even if that recognition isn't free of embarrassment. But this restriction of focus lends a certain anticipatory predictability to Hornby's work. So when I heard that he'd published a new novel about a woman involved with a man who endlessly dissects the final album of a long-vanished singer-songwriter, I confess I didn't feel an urge to run out and read it. Hasn't Hornby been here before? Well, yes and no, as it turns out. Yes, the characters and the outlines of the story are familiar; in fact, Juliet, Naked is a bit like High Fidelity retold from Laura's point of view instead of Rob's. But now his characters are a bit older, and their life options perhaps feel a bit more constrained. Juliet, Naked is the story of Annie, who has been living with college teacher Duncan for 15 years in a small, depressing seaside town in northern England. Annie humors Duncan's obsession with Tucker Crowe, the long-vanished singer-songwriter. In the mid-80s, after issuing his break-up album Juliet (think Blood On The Tracks or Shoot Out The Lights), Crowe abruptly quit performing or recording and became a recluse. Ever since, acolytes like Duncan have speculated endlessly about the meaning of Crowe's songs and the circumstances of his life. This being the Internet Age, of course, those speculations are circulated to fellow obsessives via blogs, listservs and Wikipedia pages. So when a demo version of Juliet, called Juliet, Naked, comes to light Duncan receives a copy for review. He proclaims it a masterpiece superior even to the original version, but Annie feels quite differently: "...it was Juliet, without all the good bits" (p. 39). That difference of opinion sparks a crisis between them, because like many obsessives Duncan attributes moral, ethical and intellectual dimensions to questions of taste--particularly when it comes to the work of Tucker Crowe. Duncan's reaction forces Annie to realize how stuck she and Duncan have become, while her reaction sends him in search of a less critical listener. He soon finds one in Gina, a flamboyant new art teacher at his college. The fourth character in this quadrangle is Tucker Crowe himself, who reads the negative review of Juliet, Naked that Annie posts on Duncan's website and begins an e-mail correspondence with her. He and Annie soon discover a kinship beyond their mutual feelings about the album, because Crowe is himself a bit stuck, having reached the end of another in a long string of failed relationships. Complications ensue for everyone when Crowe comes to England to visit an estranged daughter, and he and Annie arrange to meet. Juliet, Naked is well-crafted, engaging and entertaining. It points up the dilemmas of characters who have continued to drift along on their college-age conceptions of the good life, only to discover once they're facing middle age that perhaps those choices are no longer working so well. It's sure to evoke a smile of rueful self-recognition in readers of a certain age. "Sometimes Annie felt less like a girlfriend than a school chum who'd come to visit in the holidays and stayed for the next twenty years. They had both moved to the same English seaside town at around the same time, Duncan to finish his thesis and Annie to teach, and they had been introduced by mutual friends who could see that, if nothing else, they could talk about books and music, go to films, travel to London occasionally to see exhibitions and gigs. Gooleness wasn't a sophisticated town. There was no arts cinema, there was no gay community, there wasn't even a Waterstone's (the nearest one was up the road in Hull), and they fell upon each other with relief. "They started drinking together in the evenings and sleeping over at weekends, until eventually the sleepovers turned into something indistinguishable from cohabitation. And they had stayed like that forever, stuck in a perpetual postgraduate world where gigs and books and films mattered more to them than they did to other people of their age. Irritating predictability--well, yes. Annie's sudden yearning for motherhood is one of the less satisfying aspects of Juliet, Naked. Beyond the stereotype, it seems incredible that the subject of children would never have come up between Annie and Duncan, even though they've been a couple for nearly two decades and have bought a house together. Another place where incredulity rears its head is Annie's regular visits with her inept therapist Malcom, who in typical English fashion advises her buck up and reconcile herself to being miserable. It's a funny idea, in a movie script or sitcom sort of way. But would someone like Annie really continue to pay even a nominal sum in order to continue seeing someone so clearly ill-suited to helping her (or anyone) examine their problems? The novel's conclusion, while open-ended in the trademark Hornby style, leaves so many issues unresolved for these characters that it seems a bit facile (though there's a hilarious coda that I won't spoil by describing). There's another reason Juliet, Naked seems to go by so quickly: the page size is small, the margins wide and the line-spacing generous. It's over 400 pages long, but with a more conventional design would have been more like 250. Not that I'm complaining. I actually like the book's smaller size--it fits nicely in the hand, and the margins and leading make the type highly legible. Combined with the sheer readability of Hornby's prose, though, it means that the novel is over far too soon. And maybe that's a deliberate metafictional strategy on Hornby's part; after all, the ultimate lesson of Tucker Crowe's career is to leave 'em wanting more. Update 9 November 2015: Here is a belated link to my post on his collections of his Believer column "Stuff I've Been Reading." 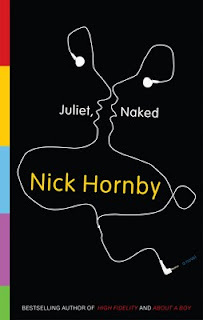 * I confess that I haven't read all of Hornby's books, including A Long Way Down (2005), his young adult novel Slam (2007), and his nonfiction books Polysyllabic Spree (2004), Housekeeping Vs. The Dirt (2006), and Shakespeare Wrote for Money (2008). The especially sharp-eyed reader will note that this means that my top-five list was thus drawn from only six books; the one that didn't make the cut is How To Be Good (2001). ** Here's a link to the full text of Chapter 1.